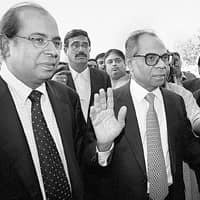 Mumbai: More than a year after the Supreme Court exonerated the Hinduja group of involvement in the Bofors kickback scandal, the group outlined its strategy for expanding its businesses in India for the first time on Monday. As a prelude to launching new businesses in the country, the group has created a structure to incubate new businesses. Hinduja TMT Ltd, one of the listed entities in the group that was managing the group’s media and BPO businesses, will now handle the group’s new businesses. The BPO business has already been demerged from the company and is a part of HTMT Global Solutions Ltd, headed by Partha Sarkar. The media business is run by IndusInd Media Communication Ltd, which continues to be a part of Hinduja Ventures Ltd. The other listed group companies include Gulf Oil Ltd, IndusInd Bank Ltd, HTMT Global Solutions Ltd, Hinduja Ventures Ltd, Ennore Foundries Ltd, and Ashok Leyland Ltd.
Hinduja TMT has been renamed Hinduja Ventures Ltd, and will continue to be headed by Ashok Manuskhani, the company president. “We are reverting to an earlier structure where Hinduja Finance used to incubate our new businesses," said Mansukhani, who has been with the group since 2000. Hinduja TMT’s shares rose 0.39% on the Bombay Stock Exchange on Monday to close at ₹ 451.45 a share. The Hinduja group has existing interests in the auto, BPO, media, banking and foundry businesses. It is now planning to enter liquefied natural gas trading, power generation, real estate and medicare, among others. The group is planning a mixed use property at Bangalore with residential and commercial properties on a 47 acre plot. The project is expected to kick off by January next year, Mansukhani said. The group also has plans to raise a half-a-billion dollar real estate fund, which is currently under the consideration of the board, said A.P. Hinduja, chairman, Hinduja Group, India. It is also planning to expand its presence in media—from cable television to content aggregation. Mansukhani said that the group was talking to a couple of foreign channels. “We will look at all forms of video content—from cable rights to direct-to-home rights and IPTV, and video-on-demand," said Mansukhani. The group has been aggressively recruiting top management. Former ONGC Ltd chairman Subir Raha recently joined the group as vice-chairman of the Hinduja Group and chairman of Hinduja Power Ltd, and will spearhead all Indian investments.